Get a pot of water boiling- you can add a few pinches of salt to it if you would like to. Once the water is boiling, add the quartered potatoes. Boil for exactly 7 minutes. Drain and set aside. In a skillet, heat the olive oil. You want it to be hot- not warm or just warming up. Wait until you see a thin wisp of smoke before adding the potatoes. Once the oil is hot, add the potatoes. Let them cook on the first side that you put them in on, and then stir the potatoes occasionally, getting them browned on each side. Evenly browning them is quite a skill. 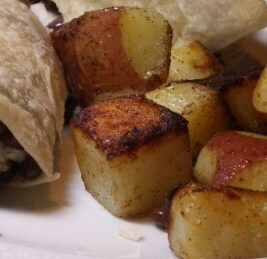 When all sides appear to have browned, add the spices, making sure they get to each potato piece. Serve hot as a side or by itself as a tapas dish and ENJOY! *If you’re red potatoes are big ones, you’ll want to cut them more than just in quarters. Basically, you want big bite sized pieces of potato. This is traditionally a Spanish tapas recipe, but it goes along well with lots of main dishes, even something like fish tacos. (Normally Spanish and Mexican foods are not to be confused/mixed, but when it works, it works). Special thanks to Alex for expertise on the potato timing and tricks of the trade.